1. C'mon cappers! We're just one 'ebonics' caption away from making Dawn's head explode. 3. "I like you, Koko. You actually listen to me. Not like those 'f**k-and-run' Bonobos." 4. "Very good, Bobo. We'll have you ready to vote Democrat just in time for 2008." 5. Today on The View, Joy Behar reads her favorite children's book to Rosie O'Donnell. 6. "You see, Hirschfield always hides at least one 'Nina' in everything he draws." 7. "Give me some peace, woman! I'm trying to take a dump, here." 8. "So, you see, compared to what Mary LeTourneau did, what we do isn't really that bad." 9. "See, if you put this book jacket over your copy of Hustler no one will be the wiser. Hillary does it all the time." 10. "Bobo! Where did you get a hold of this Enumclaw Middle School yearbook?" ...and then a plane hit the Trade Center and this tart continued to read the book for 7 minutes. "Change of plans, Senator Mikulski. Hillary will sue you for copyright if you read It Takes a Village on Sesame Street, so you'll have to read this instead." "Honestly I wish you'd been more clear in the personal ad, when you said you were Harry Dong I thought you were oriental." The indoctrination continues as the next books are "Why Koko is a Liberal" and "Koko has Two Mommies." Robin Williams reviews his next script. 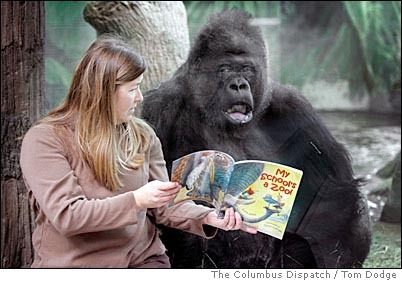 If you ask the zoo's gorilla for help in sounding out the big words, you might be a product of public school. "You're the Gorilla my dreams." You're a "silver-back?" What a coincidence - I'm a "doughy-front." Wanna mate? Georgia State uses a novel approach to prepare student teachers for entering the ranks in Atlanta schools. *sigh*... "Koko, please try to concentrate... and quit signing that stupid phrase over and over... Just what does 'One day, Caeser will come to liberate us from the oppressive dominance of mankind anyway?'" Koko signs his first complex sentence: "Would it spoil the moment for you if I smeared my own feces on this pretentious literary drivel?" "Aw, come on, Bobo. Let me shave your junk." Verification word: Tuklgwup... which sounds like something that awful man was fixing to do with those puppies. "I said, 'show me your boobies.'" "You can't read this? Great, we can sue the author for making you feel stupid." "See those? They're called 'Hooters' That's why you will never be a Thursday babe." At least it's not another gay-themed pic. *sigh*... "Koko, please try to concentrate... and quit signing that stupid phrase over and over... Just what does it mean when you sign One day, Caeser will come to liberate us from the oppressive dominance of mankind anyway?" "Would it spoil the moment for you if I smeared my own feces on this pretentious literary drivel?" Koko was depressed; what omnicient and merciful entity would bring the likes of SOTG and Submariner a couple of hot little numbers in Santa lingerie and yet stick him with THIS?!? "Now now Senator Kennedy, if you just say the things written here and stick to 12 drinks at lunch, everything will be just fine." Last known photo of the lesser known Beth Goodall, who was less successful with her gorilla experiments involving childrens books and a genital-taser.